To help customers get up to speed with a product or service, companies offer many types of documentation: user manuals, video tutorials, in-product help, even good old FAQs. Why? Because customers need heaps of help when they’re just starting to use the thing you’ve sold them. Support teams do a lot of handholding for new customers, taking more calls and responding to more emails at this point in their relationship than they will as time goes by. But one particular type of documentation—a Quick Start Guide—can cut down on the number of those “How do I…?” calls and emails from your new customers. In Part 1 of this article series, I explained what a Quick Start Guide is and why your customers want one. In Part 2, I’ll give you tips on how to develop a Quick Start Guide. Truthfully, this process will cost you some time and effort, but it’ll pay you—and everyone on your support team—back over the long run. Here are three detailed tips for identifying the content for your Quick Start Guide. Tips 1 and 2 are for existing products. 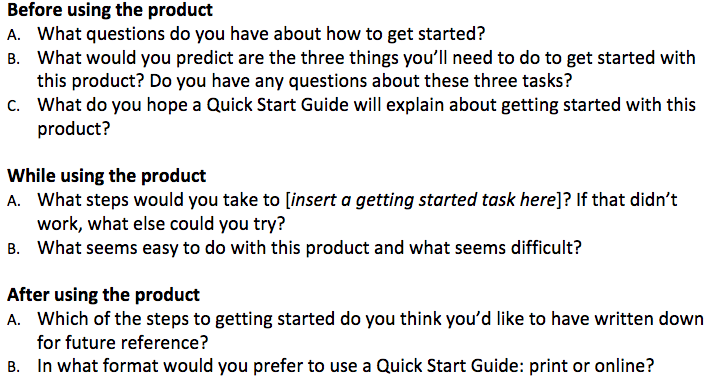 Tip 3 will help you develop a Quick Start Guide for a new product. 1. Study the questions customers are already asking. Review the most used knowledgebase articles or FAQs at your site. Find out which of the self-service content gets viewed the most. @JohnDoe: Just bought ABC Book Publishing Tool but I can’t upload images? Whyyyyyyy??? Seven y’s and three question marks indicate a level of customer aggravation that’s useful. If you want to prevent calls and emails about uploading images, explain how to do so in your Quick Start Guide. Collect the questions customers ask when they contact your company for service. Ask the support team manager or contact center manager to prepare a report about the top 10 tasks customers need help with when they contact your company for service. Plan to answer their getting-started questions in your Quick Start Guide. For example, if your company’s product is a fitness tracking app that can work with a wearable device or with gym equipment, you might learn that most customers ask: “How do I pair my ABC Fitness Tracking App with my treadmill?” That question should definitely become part of your Quick Start Guide. But the report might also show that customers frequently ask: “How do I let you know there’s an error in my monthly bill?” This isn’t a getting-started question, so you won’t include it in your Guide. Collect the questions customers ask in person: at your store, your trade show, or other meetings. Any time your company interacts with customers in person, that’s an opportunity to find out what kinds of help customers need. If you can’t meet with customers in person, you can still ask for help from retail employees or sales staff at a trade show. Provide a way for them to capture the getting-started questions customers ask. Even a simple tally sheet where they can record the number of times they hear a particular question can help you. For most customers, the full User Manual is just TL;DR. But don’t despair. You can base your compact Quick Start Guide on the long, 75-page, multi-chapter User Manual. Use a technique I’ll call “Mining the Table of Contents.” Simply print out the Table of Contents of the full User Manual and start to mine it, or read carefully through it. Pick out topics listed there that should be included in the Quick Start Guide. Here’s an example. This is the Table of Contents from the 66-page User Manual for the ABC Sport Waterproof Video Camera. 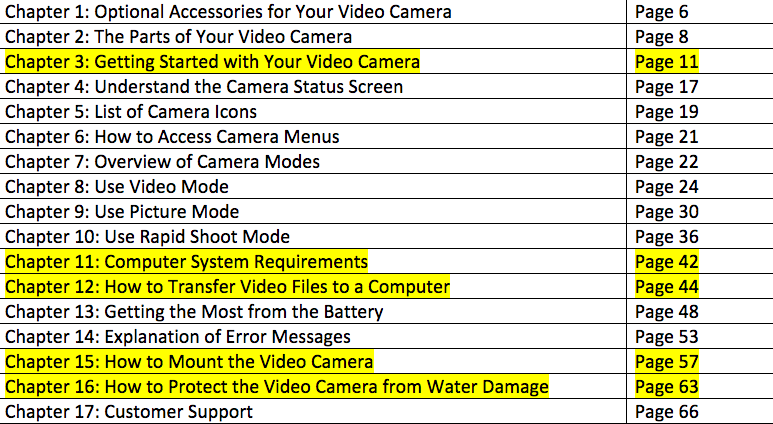 I’ve mined this Table of Contents for topics for the Quick Start Guide and highlighted the ones customers will need to get started with the video camera. Set up a test environment and invite a small group of prospective customers to try the product. Here are questions to ask this group of users before, during, and after they’ve tried the product, so you’ll know what to put in your Quick Start Guide. Customers may find this exercise frustrating because you’re asking them to look at a list of help topics, but you’re not giving them any help! So place a time limit on this exercise. Depending upon how complex your product is, this exercise should last about 10 – 20 minutes. You don’t have to be a professional technical writer to develop a Quick Start Guide. You do have to be a “mimic” and an advocate. You’ll need to think like your customers and be on your customers’ side to truly help them at the start of their journey with your product or service. And in return, you’ll receive fewer of their calls and emails asking basic, getting-started questions. And that’s a good thing. 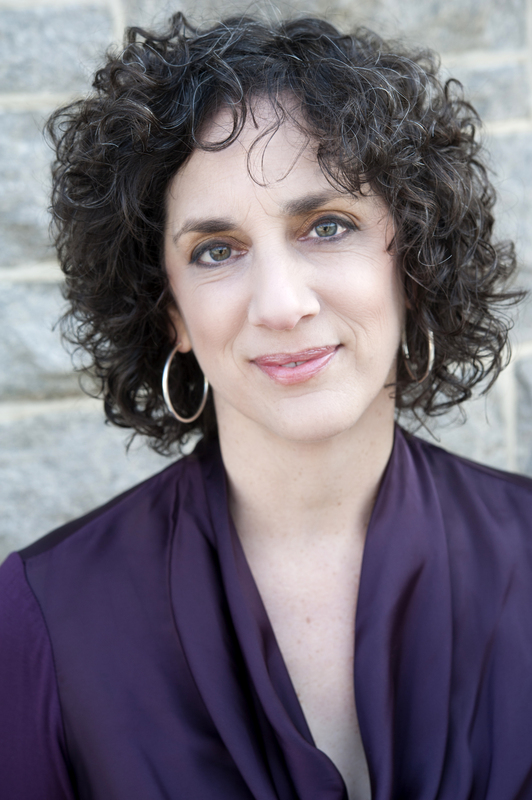 Leslie O’Flahavan has helped thousands of people learn to write well. As Founder of E-WRITE, she’s is a problem-solver for all the writing-related challenges faced by contact centers: e-mail, chat, and social media. She helps contact centers train agents to write excellent e-mail, measure the quality of their e-mails to customers, and rewrite and maintain their entire template library.